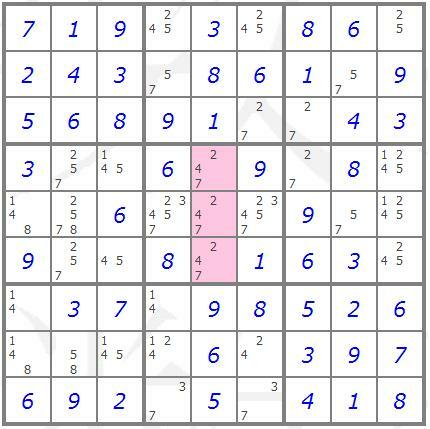 The "naked single" solving technique also known as "singleton" or "lone number" is one of the simplest Sudoku solving techniques. Using this technique the candidate values of an empty cell are determined by examining the values of filled cells in the row, column and box to which the cell belongs. If the empty cell has just one single candidate value then this must be the value of the cell. In the example below, if you examine the values of the filled cells in the same row, column and box as the highlighted cell you can see that the highlighted cell has only a single candidate value since all other possible candidate values are already used. To illustrate this more clearly the same example with candidate values in empty cells is shown below, as you can see the highlighted cell has a single candidate value. The "naked pair" solving technique is an intermediate solving technique. 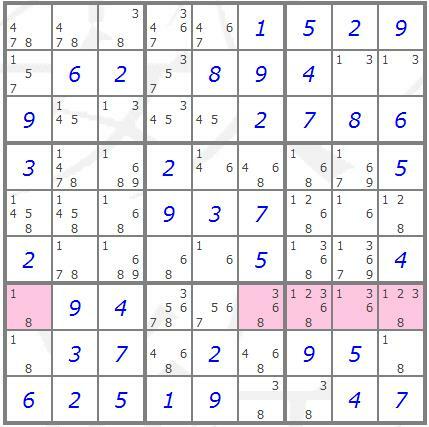 In this technique the Sudoku is scanned for a pair of cells in a row, column or box containing only the same two candidates. Since these candidates must go in these cells, they can therefore be removed from the candidate lists of all other unsolved cells in that row, column or box. Reducing candidate lists may reveal a hidden or naked single in another unsolved cell, generally however the technique is a step to solving the next cell. The highlighted cells in the example below show a naked pair containing the candidate values (2,3) in the third column. Since this is a naked pair the candidate values can be removed from all other unsolved cells in the column. This reveals a second naked pair containing the candidate values (7,9) in the same column. Reducing the candidate lists of other unsolved cells in the same box reveals a naked single. The "naked triple" solving technique is similar to the naked pair solving technique described above. In a naked triple, three cells in a row, column or block contain some combination of the same three candidates. Each individual cell in the naked triple does not have to contain all three candidates however. In fact it is perfectly legal for each individual cell to have only two of the three candidates. The highlighted cells in the example below show a naked triple containing the candidate values (2,4,7) in the centre box. These candidate values can be removed from all other unsolved cells in the box. 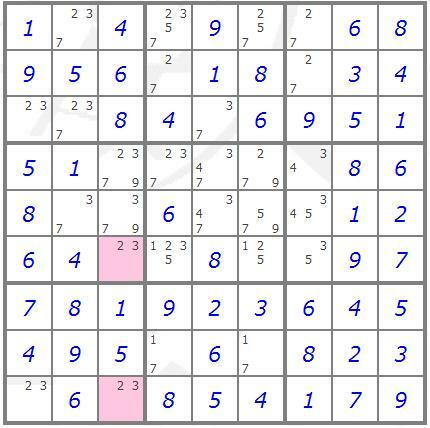 This reveals a naked pair containing the candidate values (3,5) in the central row of the same box. Reducing the candidate lists of other unsolved cells in the same row reveals a naked single in that row. The "naked quad" solving technique is similar to the naked triple solving technique described above. In a naked quad, four cells in a row, column or box contain some combination of the same four candidates only. 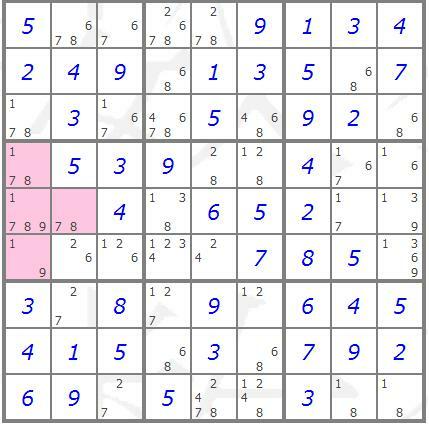 The highlighted cells in the example below show a naked quad containing the candidate values (1,7,8,9). These candidate values can be removed from all other unsolved cells in the box. This reveals a naked pair containing the candidate values (2,6) in the bottom row of the same box. Reducing the candidate lists of other unsolved cells in the same row reveals a naked single in that row. The "naked quint" is the final solving technique in the naked subset series and is similar to the naked triple solving technique described above. In a naked quint, five cells in a row, column or box contain some combination of the same five candidates only. The highlighted cells in the example below show a naked quint containing the candidate values (1,2,3,6,8). These candidate values can be removed from all other unsolved cells in the row. This reveals a naked pair containing the candidate values (5,7) in same row.